Check Out Star Wars: Rogue One – first TV spot! Update: Where there are trailers for major movies, TV spots generally follow. And as the marketing hype machine continues to gather pace following last month’s Star Wars Celebration Europe, along comes the very first small-screen promo for Gareth Edwards’ Star Wars spin-off. Star Wars Celebration Europe is currently in full swing, and the centrepiece of the whole event is the panel for this year’s Star Wars: Rogue One. Hosted by Gwendolyn Christie – who played Captain Phasma in The Force Awakens, fact fans – it gave us a bit of an inside look at Gareth Edwards’ forthcoming stand-alone movie. Recently, too, Disney and Lucasfilm has, through Entertainment Weekly, released a quartet of new stills from Star Wars: Rogue One. You can fire them up by clicking on the gallery widget up at the top of the screen. Rogue One: A Star Wars Story is an upcoming American epic space opera film directed by Gareth Edwards and written by Chris Weitz, from an idea by visual effects supervisor John Knoll. It will be the first stand-alone Star Wars Anthology film, and the ninth theatrical feature film in the series. Set in the Star Warsuniverse shortly before the events of A New Hope, the story will center on a group of Rebel spies on a mission to steal the plans for the Galactic Empire‘s new weapon, the Death Star. 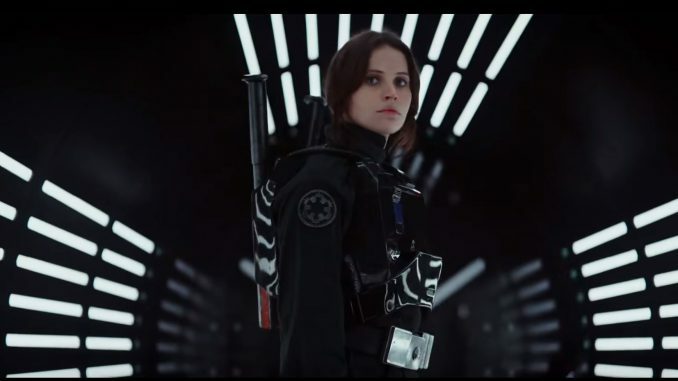 It will star Felicity Jones, Diego Luna, Riz Ahmed, Ben Mendelsohn, Jiang Wen, Donnie Yen, Forest Whitaker, Mads Mikkelsen, Alan Tudyk and Jonathan Aris.